If you're looking to immerse yourself in cultural traditions that date back thousands of years, you don't need to board a plane to Europe or Africa. The United States contains some 326 Indian reservations that together cover 56 million acres of land -- roughly the size of Idaho. Chances are good, in fact, that you've already driven through a few without even realizing you'd crossed into a sovereign entity with its own unique rules and reasons to visit. Casinos might be the most famous -- certainly they're the most lucrative -- but all over the West, especially, there are great reasons to visit beyond any sort of gambling. Some reservations are more open to visitors than others. Those that do embrace tourists offer myriad ways to experience a unique culture. As in all things, though, you gotta know where to look and, of course, to respect the fact that once you cross that border you are a guest in a different land. The Miccosukee are best known in South Florida for their casino and resort, but when it comes to alligator wrestling, they don't play around. 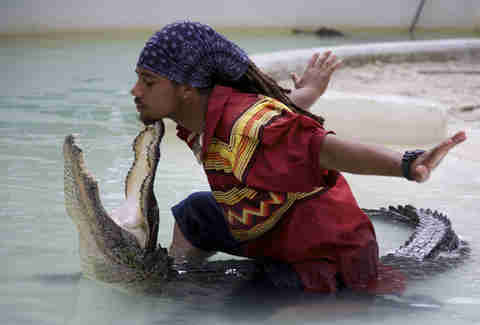 They put on live "alligator demonstrations" daily that feature performers holding an alligator's jaws open with their heads. More relaxing will be seeing gators from the scenic airboat rides through the Everglades that drop you off in an authentic hammock-style Indian camp that has been owned by the same Miccosukee family for more than 100 years. This may be one of the more touristy reservations in America, but all in all it's a more-than-worthy diversion along Florida's Alligator Alley. Even if you've been there, you probably had no idea Arizona's largest ski resort is owned and operated by the White Mountain Apache Tribe. 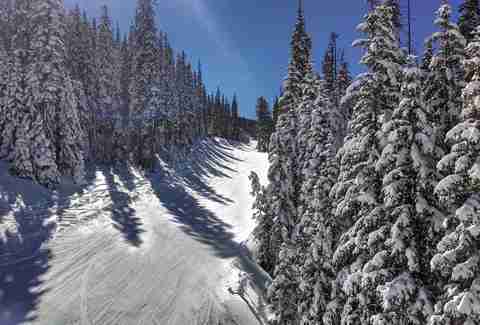 Consisting of three mountains with a base of 9,200ft and showcasing some of the Southwest's finest skiing, Sunrise Park Resort is aces in the winter. In the summer, come back for zip lines, archery, scenic lift rides, and horseback tours of the reservation. 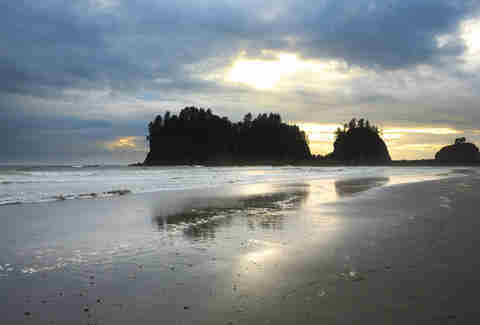 The peaceful oceanside community of La Push, Washington has been home to the Quileute Tribe for thousands of years… long before the area was made famous as the location of the Twilight books. Thankfully, the vampire cheese hasn't spoiled this seductive paradise of gentle ocean waves and whale watching on the beach. While here, stay at the tribe-operated Oceanside Resort. Go in the summer for the annual Quileute Days -- the native salmon bake is a must. 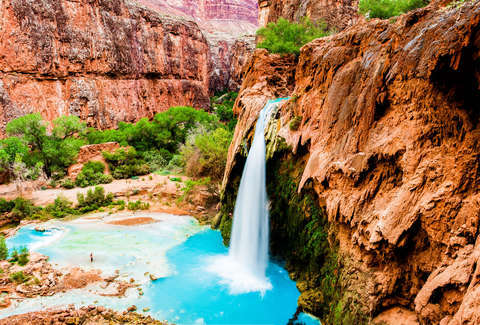 It's well-documented fact that Havasu Falls and Mooney Falls are two of the most stunning waterfalls you will ever lay eyes on -- and, contrary to popular assumption, these paradises aren't in Grand Canyon National Park. 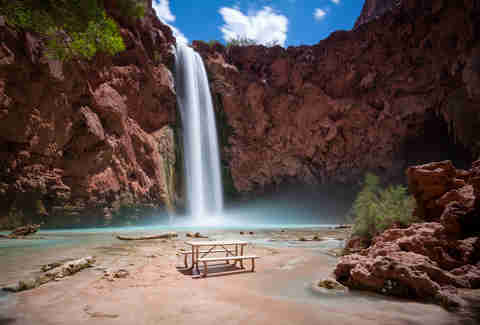 Instead, they lie just south, within the Havasupai Indian Reservation, and are accessible only after acquiring a permit from the tribe and undertaking a strenuous hike (worth it). While here, explore the native town of Supai (one of the most remote in America) and the glorious Havasupai Trail, as well. The only remaining Indian reservation in Alaska, the native home of the Tsimshian people, is a small island located off the coast some 15 miles southwest of Ketchikan. Its main town is the 1,500-strong community of Metlakatla, where you can indulge in such typical tourist offerings as watching traditional native dancers in full regalia, guided historical tours, and browsing native art. Only, you know, on an island. 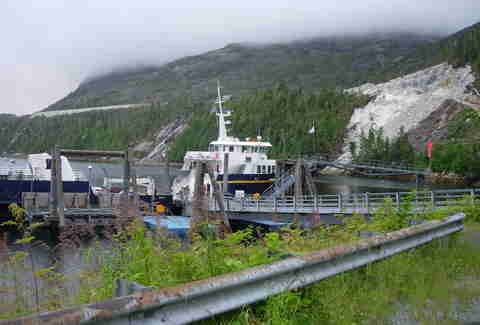 In Alaska. 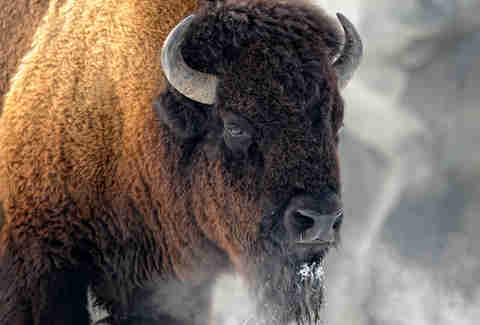 You don't need to visit Yellowstone to take part in the all-American experience that is observing bison in the wild. You can also take a trip out to Northeast Montana's sprawling Fort Peck Indian Reservation to peep around 200 genetically pure bison roaming their historic home in the Northern Great Plains, thanks to recent relocation efforts, with a large number of bison recently being transferred from Yellowstone to the reservation. Well known to Burning Man burners because of its location on the route from Reno to Black Rock, this hidden gem is unknown to most non-burners (aside from the few thousand members of the tribe whose reservation encompasses it). 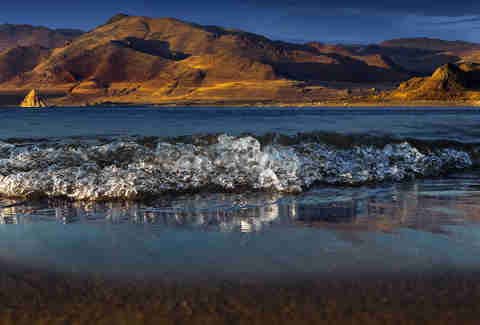 Surrounded by unusual rock formations and playing a central role in the history of the Paiute tribe, the beautiful spiritual site is to be enjoyed as much as it is to be respected. 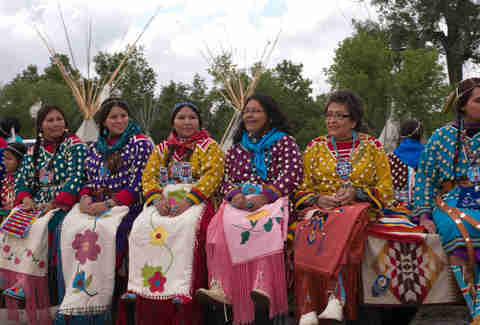 Many reservations offer traditional Native American dances at annual festivals for tourists, but few parties are bigger than Crow Fair, the annual summer pow-wow at Southern Montana's Crow Indian Reservation. The largest modern-day American Indian encampment in the nation offers an all-Indian rodeo and Indian relay horse races, with a historical reenactment of Custer's Last Stand earlier in the year. Primarily located in Arizona but also encompassing parts of Colorado, Utah, and New Mexico, the 27,000-square-mile Navajo Nation is huge -- like, the size of West Virginia huge. 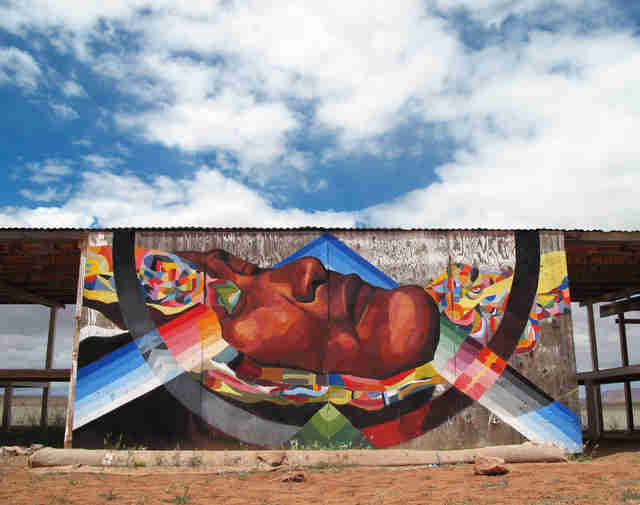 Navigating all that space can be difficult, but the Painted Desert Project seeks to foster connections with its residents by encouraging artists to embed themselves in local communities before painting brightly colored murals on abandoned buildings and roadside stands throughout the reservation. Capturing modern-day "life on the rez" in a way no museum could, this handy map tells you where you can catch 'em all. Teepees and sweat lodges may get all the attention, but to truly experience an authentic Navajo home, you can't beat a night in a hogan -- a small hut-like, dome-shaped dwelling made of natural materials and sacred to the Navajo. There are several to choose from (like those at the Navajo-owned Monument Valley Simpson's Trailhandler Tours) within the iconic Monument Valley, which also sits within Navajo Nation, by the way. The Simpson's tour includes a sunset Jeep tour through the tribe-owned Monument Valley Navajo Tribal Park plus an authentic Navajo taco dinner, campfire folktales, and native dance. While not technically on a reservation (the land, like much of Eastern Oklahoma, is deemed an "Oklahoma Tribal Statistical Area" by the Bureau of Indian Affairs), the town of Tahlequah is noteworthy as the capital of the Cherokee Nation. With Downtown street signs written in both English and Cherokee, the town houses the Cherokee National Supreme Court (built in 1844 as the oldest government building in Oklahoma) and the circa-1875 Cherokee National Prison (both now museums), as well as the Cherokee Heritage Center featuring a completely reconstructed Cherokee village. 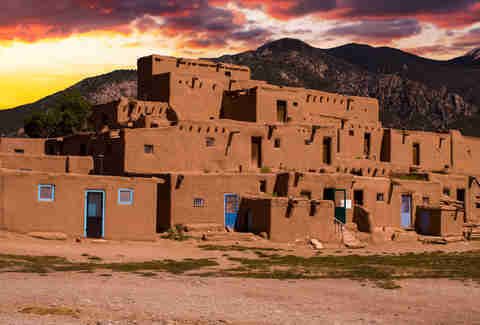 For a modern Indian village that dates back 1,000 years, visit the picture-perfect, tribe-owned Taos Pueblo attached to New Mexico's Taos Indian Reservation. It's one of the oldest continuously inhabited communities in the United States -- to this day, it's home to about 150 Taos Indians. 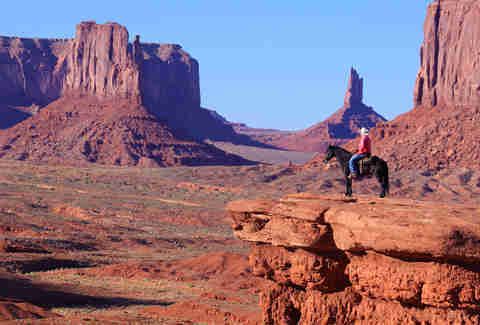 Stunning vistas abound throughout the Indian reservations of the great American West. 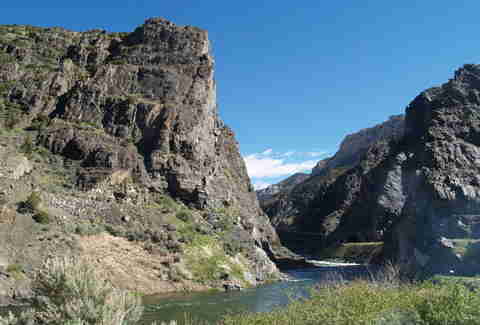 One such example (although by no means the only) is Wind River Canyon Scenic Byway, otherwise known as US 20, which winds from Shoshoni to Thermopolis in central Wyoming. Passing through parts of the starkly beautiful Wind River Indian Reservation, the route abounds with views of bare yellow and red rocks set against mountain backdrops dotted with bighorn sheep. Also impressive is the 350-mile Native American Scenic Byway from Chamberlain, South Dakota to Cannon Ball, North Dakota. It passes through four Lakota Indian reservations and is stocked with native memorials, monuments, and sacred sites, including national monuments to Sakakawea and Sitting Bull. OK, this last one has nothing to do with Native American culture. 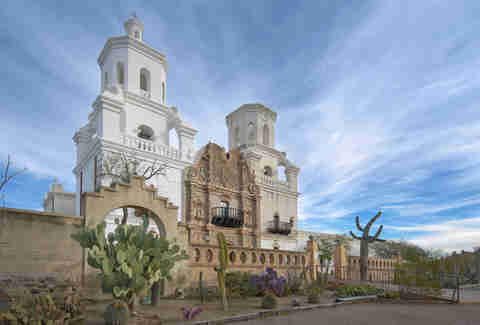 But the fact that Southern California's bi-annual Desert Hearts music festival takes place on native land within Los Coyotes Indian Reservation (located about halfway between San Diego and Coachella) makes it too irresistible to let pass without mention. 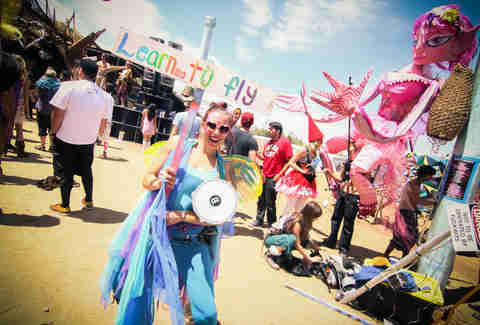 With EDM DJs, live art, and all manner of desert freak-fest weirdness, what this Burning Man-style gathering lacks in native authenticity it makes up for in plenty of other ways. Jay Gentile is a Thrillist contributor and, for fun, he wrestles alligators in his spare time. Or at least watches other people do it. Follow him @innerviewmag.